Here is proof that somebody young is working on the Barack Obama campaign. 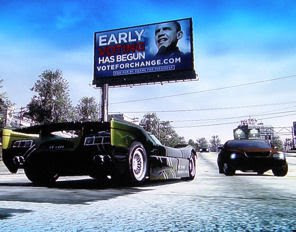 Ads for the candidate are now appearing in sports video games including Madden '09. The ads, appearing in swing states Colorado, Florida, Iowa, Indiana, Montana, North Carolina, New Mexico, Nevada, Ohio and Wisconsin, will be in the form of stadium signage and billboards. (Game cover courtesy of Business Wire) The ads will run until Nov. 3 and will also appear in other Xbox games including Burnout Paradise, NASCAR 09, NHL 09, NBA Live 08, Need For Speed: Carbon, Need For Speed: ProStreet, NFL Tour," and Skate.